Mare motels of all sizes and shapes are available. Call us with your stall sizes, and number of stalls desired, and we can qoute you up the lowest priced Mare Motel on the market today! Utility covers are avaiable in all sizes and shapes. This unit covers SBC Phone Co. equipment at Lake San Antonio, in Monterey County, CA. We can design a cover that will fit your company's needs, just call us for details. 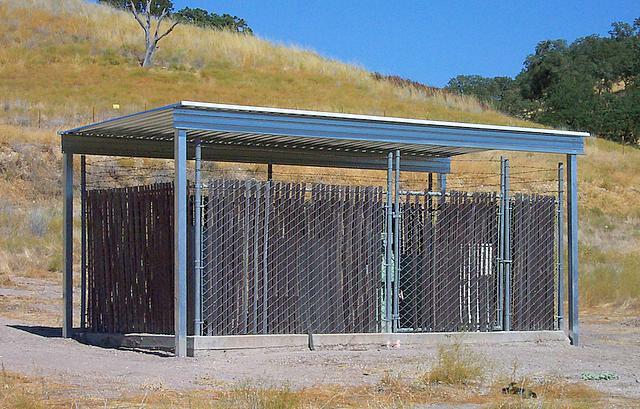 Oil and Mining companies all over California use our products over high power substations, communications sites, sorting stations, and more. Heights up to 24', and any width, any length, how can we help you? World famous Vulcan Mesa Farms chose our shedrow design covers. This unit is 102' long by 26' deep, 9 1/2' tall. Any size shedrow, or gabled roof can be built. Call us for a free quote! Commercial customers love our affordable parking shades. We can tailor one to fit your size, and budget requirements! Call for quotes on custom sizes, we're glad to help you get just what you need. People tell us their horses have been "rough" on other products... That's nothing compared to these guys! This is why we are the #1 choice of exotic animal breeders. They have known for years our covers are a lot tougher than the competition's flimsy structures. Remember, we offer a limited lifetime warranty, ask other dealers if they can, or will match that! Our basic Pasture Shelters are tough enough for even Texas Longhorns! It's easy to add additional working space onto existing buildings. Just call for a free quote on your project.